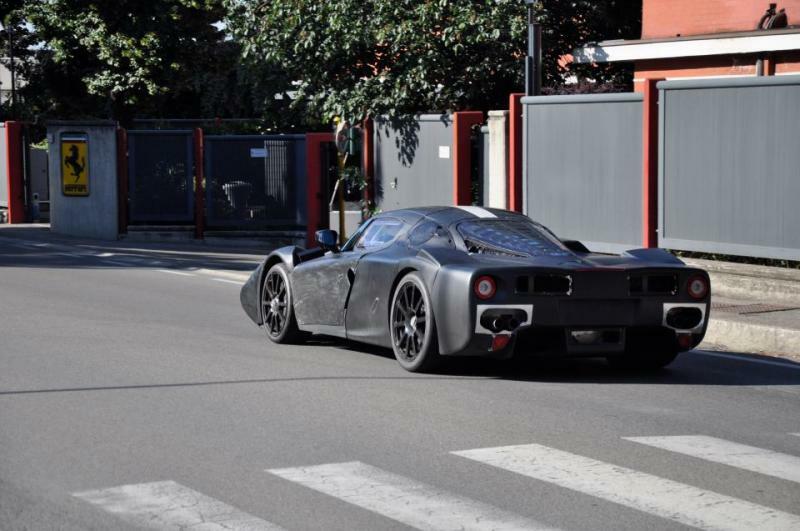 These are the first spy images of the Ferrari Enzo replacement, scooped testing outside the marque’s factory in Maranello. The disguised model – codenamed F70 and set to be Maranello’s most expensive hypercar – sits extremely low to the ground and features an elongated rear to house it’s 7.3-litre V12 engine. Mated to the engine is a dual-clutch gearbox and electric motor. Initial reports suggest the HY-KERS system is tipped to produce in the region of 900bhp, which may enable the F70 to strip the Bugatti Veyron from its title as world’s fastest car. Some more recent reports suggest the F70 will feature a biturbo engine, most likely a V12, combined with the HY-KERS system and four-wheel drive for a total output of 1000 HP. Under the carbonfibre skin of the F70 front sits another electric motor to run ancillaries. Behind the new hypercar’s wheels (which feature an F1-style single bolt) sit large, drilled brake discs. A quad exhaust system exits the hypercar’s rear. The innovative HY-KERS system will make the new Enzo the cleanest and fastest Ferrari in the range. The new Ferrari Enzo F70 is expected to go on sale at the beginning of 2013. Zero to 200 km/h (124 mph) time is expected to be 6.5 seconds.